The Sonic the Hedgehog franchise has enjoyed nineteen sweet years – not too far behind the beloved Super Mario Bros. series it sought to compete with – and while it may never have ascended to quite the same heights that the Italian plumber managed to scale, in its time it certainly made some waves and has therefore become an important piece of gaming history nonetheless. With today’s release of Sonic the Hedgehog 4: Episode 1 for WiiWare, let’s spin back the hands of time and evaluate the classic series before we dive into the long-awaited sequel later this week. The premise is typical for a classic game: find mystical objects, defeat the Big Bad Guy, and save the world. 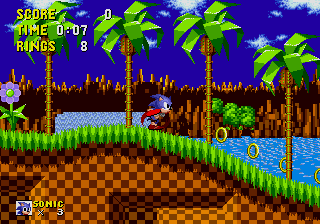 But once the game booted up, it was clear that Sonic, while clearly inspired by Mario‘s platforming, was a completely different animal (no pun intended). The scenery of South Island carried a unique visual flair and featured its own blend of modern and futuristic setpieces, a sharp contrast to Mario‘s literal mushroom trip of a world. I’m sure we all remember the checkerboard style incorporated into Green Hill Zone (pictured at right). The graphics were strong for its time, a testament to the Genesis’s capabilities, and they’ve aged fairly gracefully. The controls handle well, being just simple enough to get the hang of easily but with enough intricacies to keep you learning new tricks as things progress. This wasn’t a game for the faint of heart, and in fact, it wasn’t until recently that I actually completed any of the main Sonic games (which I mostly owe to never owning a Genesis). It’s a testament to tricky and unconventional level and enemy design. That brings me to one of the greatest features the series offered: intricate branching pathways. As many will tell you, the fun of Sonic comes just as much from finding all of the secrets as it does from simply clearing all the zones. And it’s true; to this day I doubt I’ve found all the nooks and crannies. There are a fair amount of surprises outside of mere level secrets, such as the “WTF” moment when you reach the boss in Labyrinth Zone, that keep the experience fresh throughout. Add to that the other quirky Sonic novelties, such as its solid musical score, trademark item “monitors,” fun powerups such as the Super Shoes, Special Stages, and the unique Ring life system, and the rest is history. All in all, though, it’s clear why Sonic has become one of the most memorable game series we’ve ever known. 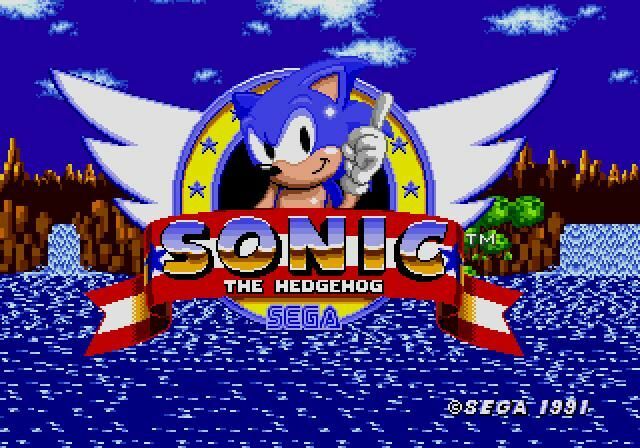 Sonic the Hedgehog 2 was like god’s gift to Sonic fans. Not only did it introduce a new playable character, a corresponding 2-player cooperative mode, and a ton of graphical updates and new gameplay features – it was a much bigger and more diverse game than its predecessor. Visually the game looked a lot like a Sonic Director’s Cut, with many of the zones drawing obvious inspiration from the original game, while at the same time advancing the level themes. A famous example is the Casino Night Zone, which took the concept of a nighttime pinball area, first introduced in Sonic 1 (Spring Yard Zone), and fleshed it out considerably, thus creating one of the most memorable levels in the series. In this sense, Sonic 2 can be seen as a sequel done right. It stayed true to the things people enjoyed about the first game but injected them with life and vigor to make them seem new. The musical score advanced at the same pace as the level themes, adding even more depth to the progression. The updates weren’t just in the sense of visuals and design, though: the world of Sonic 2 seemed more the part of a storyline than the original, with the introduction of Tails, Silver Sonic, and the Death Egg. On the gameplay side, the advent of Tails of course led to a co-op mode, a revolution for its time. But in terms of pushing the series forward, probably the most memorable new feature was the Spin Dash, now Sonic’s signature move. The Spin Dash capitalized on Sonic’s super speed and made the game less about complex platforming and more about high velocity, low-time runs through dangerous obstacle courses. The change has left a mark on the series and its level design, and allowed for craziness like running through a gauntlet of hills and loop-de-loops underwater in Chemical Plant Zone. 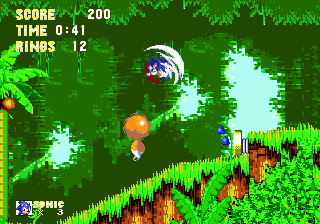 Aside from that, Sonic 2 saw upgrades in boss design, sporting some of the most involving battles in a side-scroller to date, as well as sheer level size, allowing for more of those happy branching pathways and secret shortcuts. Many of the weird issues from the first Sonic seem to have been done away with, leaving a game with a greater level of polish and a lot more pizzazz than its forerunner – epitomized in the top-secret Super Sonic tranformation. What more could you want? Eggman, he had Knuckles and the Master Emerald to contend with. (If you’ve ever read the comics or even played the 3D console games, you know just how significant the story grew after this.) There was a sense of continuity in the air, made present from the very first zone, where incinerator robots set the forests of Angel Island ablaze in the end of the first act and the zone boss has you outrunning one of Eggman’s bombers in a heated race out of the burning jungle. It was a really cool feature in a platformer, which traditionally had stayed away from this kind of storytelling and instead made each level a micro-world. Apparently the design team behind Sonic 3 went to great pains to outdo Sonic 2, because the new game featured even a ton of all new moves, level features, and powerups. This time, Sonic could activate a temporary barrier mid-jump to protect him from enemies and help him deal damage to a wider area, and Tails played a more active role, carrying Sonic at intervals and even during a certain boss. Tails also received the freedom to use his powers of flight during a Tails-only game, adding more diversity and a stronger incentive to play as the young fox. The new powerups were neat as well, and consisted of three variants of the barrier field from the first game: one lightning barrier that attracted Rings and could increase the height of jumps, one flaming barrier that protected from fire damage and enabled Sonic to do a horizontal dash in mid-air, and a bubble shield that allowed for unlimited air underwater and a nifty bouncing move. I’d compare Sonic 3 to Mario Bros. 3 in that respect: it really capitalized on creating new gameplay options while of course keeping the core gameplay intact. The levels themselves, while extremely well-done, were kind of hit-and-miss in terms of originality. 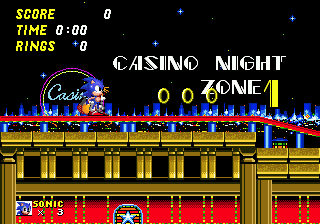 I’ve already described in some detail the interesting scenario of the first zone, but Carnival Night Zone, which came later, looked and felt mostly like Casino Night from Sonic 2. Of course, they introduced a unique twist involving a massive power outage that still managed to make the level feel new, but it wasn’t quite the same type of progression we saw between the first and second games. This was offset by featuring a large cast of enemies and truly unique bosses (including several that weren’t Eggman! ), atmospheric music as well as a few since-enduring pieces, the nifty Special Stage concept, and a whole lot more of those seemingly never-exhausting secret passages. Adding the ability to connect Sonic & Knuckles to incorporate the echidna as a playable character made the game even more replayable than the last two, so it’s no wonder the game is considered by many to be the pinnacle of the series. Overall, it’s clear why the Sonic series has stuck around so long. Spin-off games like Sonic & Knuckles (okay, it’s not technically a spin-off – I just didn’t have time to play through it for this review), Sonic Advance, and Sonic Rush have shown that classic side-scrolling platforming will never die, and so that makes us all the more excited that Sega’s finally moving on to a true Sonic 4.